proMX is a system integrator and software development company consulting and supporting companies to become agile organizations. The main competencies are CRM, xRM, project and resource management, and cloud migration. Proteus Cloud Platform helps businesses to transform user experiences via robust content management to custom web applications. 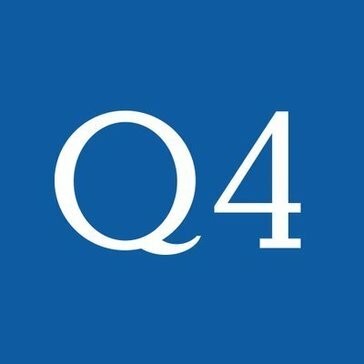 Q4 is a global leader in cloud-based investor relations and capital market solutions. We understand a CRM composes an important part of your business. Whether used for monitoring new leads, tracking your sales process, scheduling follow-up reminders, generating reports, or reviewing daily activities, Qobrix captures all of your business processes and eliminates complex and ineffective features that have been built into off-the-shelf CRMs which are never used! Users can also scale Qobrix on any vertical by adding new modules in rapid time, integrating with existing third party software seamlessly via API or introducing new configurations to adapt to shifting business requirements. Managing sales process, sales staff and daily reporting is easier with Qontak's software and data. A new approach - a Virtual Information Environment that provides an integrated set of Activity and Customer Management Applications for everyone in the company, creating a complete, mobile Business Information Center. Qwikkr is a solution that combines information management for everyone with a powerful CRM for the sales team to connect the entire small business. CRM that works seamlessly with Gmail. RadiumCRM is an effortless way to get work done with anyone. We provide the best tools so you can focus on the most important deals. Builds and develops useful applications that you can download from Ready_market. ReframeYourClients all-in-one business development software helps MSPs in 12 time zones demonstrate to their clients that IT is a huge competitive advantage, not just a commodity. A pioneer in MSP 2.0, ReframeYourClients aims to help its customers build the next generation of IT businesses. Rianu is a CRM for developers. It has a set of API's that allow you to plug your current internet buisness onto Rianu. Speed To Contact is an enterprise sales automation company and the makers of RICOCHET (the fastest internet lead dialer commercially available). RICOCHET is clean, efficient, and great for both inbound & outbound call centers looking to automate their workflow. The company specializes in developing custom dialing solutions as well as CRM integrations (Minimum of 5 Users). Sign up for a free demo in seconds and blast your conversion & retention rates into the sky. No two business are identical.At roboeyelabs, we understand businesses require a solution that is flexible and customizable to fit their unique needs. We also believe in empowering our customers to make their own customization decisions regarding workflow, UI, database changes and more, without having to be professional programmers. Saarif CRM is a Sales and Relationship Management cloud platform that focus on improving the productivity of sales team and simplifies the complexities of day-to-day sales processes, while delivering agility to business. SalesCRM+ allows you to achieve more in less time using AI, Machine learning, Predictive analysis, Pattern reading and more. Tools that learn by time and matures. SalesFirst is a sales and marketing automation software with contact management, marketing campaigns, laptop synchronization, and more. Frontline Distribution ERP software is a product for manufacturing, exporting, and trading organizations. Keep track of every activity from order to cash; through integrated modules namely Procurement, Sales and order Management, Stock Management, Production Planning and Control, Financial and Cost Accounting, HR and Payroll, etc. The Most Advanced Outlook CRM. Ever. Salestrakr offers web-based CRM and sales force automation solutions. Salpo CRM is a powerful and flexible platform that sits at the heart of your business. It allows limitless custom fields, tailored bolt-on modules, and third-party integrations, so it looks, feels and functions like your business. SCRMpro CRM software solutions have consistently helped improve our clients' customer response time and enabled them to meet the core requirements of their business owing to its user-friendly features and customizable interface. Selltis develops and provides on-demand customer relationship management (CRM) software for industrial distributors, representatives, and manufacturers. Selltis CRM is a team-selling software solution for industrial sales organizations and their channel partners, providing sales cycle management, including lead tracking, dashboards, to-do lists, customizable alerts, and account profiling. A sales support tool that utilizes organization knowledge. In addition to management functions such as customer management and case management, generally called SFA CRM, Senses has a function to analyze success / failure cases from AI algorithm based on accumulated sales information. Senses will support "when", "who", "what", "how" "from past success or failure cases. Shape is a cloud-based helps you grow your company with tools that streamline workflow, super charge employee productivity, and automate everyday tasks. Shapes features are tailor-made to solve your unique industry challenges. Shark Byte CRM is a customer and sales relationship manager designed for mechanical service, plumbing and, HVAC companies. Shark Byte is a CRM Sales Tracker, with Mobile Building Surveying tools, Estimating, and Proposal Generation. ShootQ is a cloud-based CRM system for creative people including Professional photographers, videographers, wedding industry professionals, and many more creative types. This platform allows you to manage contacts, all of your jobs, send proposals, contracts, track your calendar and more. Simplifyd makes invoicing, sales pipeline and CRM simplified. It supports individuals and small teams to better manage their communications, their finances and the relationships to their business. With the CRM software, your organizations sales cycle efficiency and consistency will be enhanced. Skyward CRM aims to help business to improve their relationship with customers by creating differentiated and winning CRM strategies. It offers the same level of customization, functionality and integration with third party tools and systems for both on-premise and cloud. It is easy, adaptable, affordable CRM for small business as well as medium sized businesses. The Skyward CRM allows you to achieve targeted results as all features can be customized. Simply put, Skyward CRM helps you and your sales team do the right things, at the right time. Our Smalution CRM can be customized as per industry needs and already present across the globe, Smalution CRM has been well appreciated for being different as compared to the other CRM’s. SmartTouch CRM is a solution that includes tools for sales & marketing performance reporting, sales automation, contact record management, and more for real estate professionals. Our flagship product a hosted CRM product that is simple, easy to use, affordable, and has everything you need right out of the box. Stay connected with your business contacts, collaborate as a team and get your customers, prospects and other stakeholders together with all your communication, activities, documents and files in a shared database. CRM application built to stay current with recent technologies and trends. SuiteCRM is a free and open source alternative to Salesforce, Dynamics and other proprietary software. Feature rich, powerful, flexible and user-friendly, it is one of the most popular CRM applications globally. SuiteCRM is a software divergence of the well-liked customer relationship management (CRM) system SugarCRM. nTireCRM is a web based customer relationship, incident, lead management system designed to help enterprise across diversified verticals viz. Surefyre CRM is built from the ground up for insurance. Agencies using Surefyre spend more time focusing on what matters, closing deals and keeping customers happy.